Liongate’s take on Mike Mignola’s Hellboy arrives next week, with the studio building up huge hype for its R-rated reboot. The film’s latest featurette focuses on the use of practical effects. And they’re more impressive than you may expect. In the video, the film’s stars explain how important practical effects are for the movie. “We did a lot of practical stuff on-set,” said David Harbour, who portrays the demonic hero. The practical effects include the make up and costumes that bring these characters to life in vivid detail. Most of this work comes from make up artist Joel Harlow, who previously won an Academy Award for his work on 2009’s Star Trek. He credits the team with “being able to break new ground with prosthetics.” It shows throughout the video, particularly with creatures like Gruagach. This hog-like fairy serves as the powerful right hand to Milla Jovovich’s Blood Queen. While many of these effects are practical, some combine with CG for a more seamless result. This includes motion capture for a creature that pursues Hellboy’s character in a twisted manner. There’s also the awesome effect of the hero rising out of the ground, sword in hand, complete with fiery crown. “You have to see it to believe it,” noted Harbour. Though the featurette is a bit on the short side, it does provide a good look at the film. Hellboy’s encounter with a giant rat creature is particularly fun. Hellboy will hit theaters on Friday, April 12. 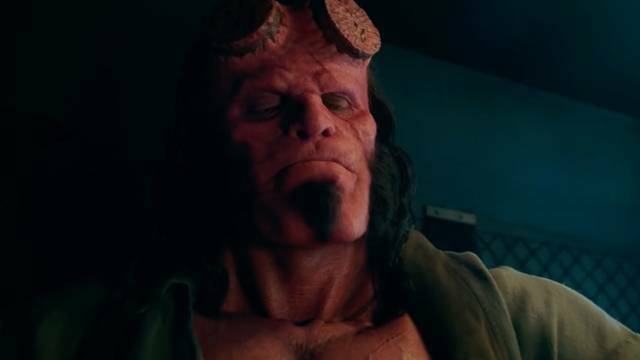 What do you think about Hellboy’s practical effects? Let us know in the comment section below!